This statistic displays attitudes towards brands funding television programs among consumers in Germany in 2013. As of fall 2013, 33 percent of respondents in Germany reported that they don't always notice if a company is sponsoring the TV programs they watch. 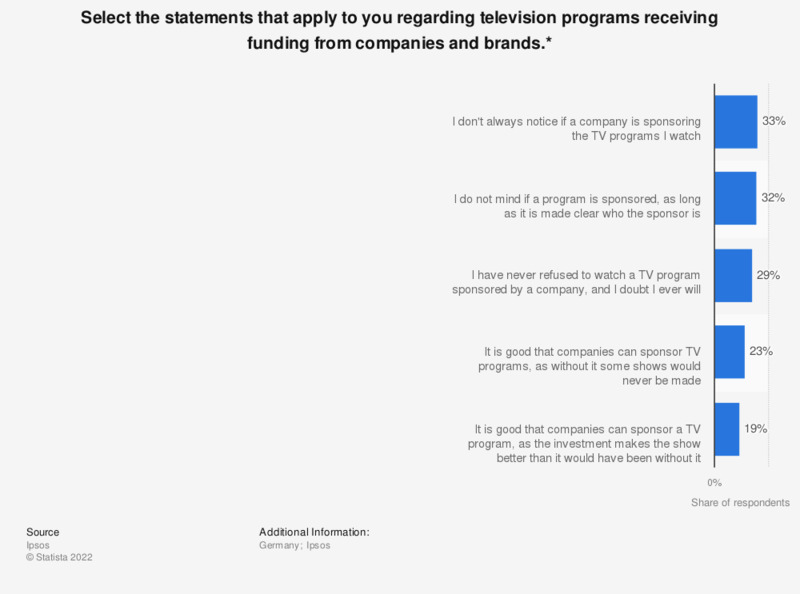 * The original survey question was stated, "Nowadays, some television programs receive funding from companies and brands in return for the right to sponsor them. Here is a list of statements; please select all that apply to you." ** Research was carried out in two waves. The source indicates the survey was conducted with questions put to a total sample of 16,039 adults across 20 countries in September 2013 or to a sample of 16,167 adults in October 2013. Do you conduct online research about products seen in TV shows or TV ads?